This puzzle I created for 10th 24 hour Puzzle Championship. 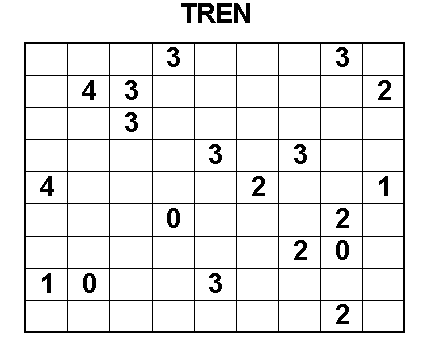 TREN Puzzle type also appeared in OAPC Puzzle Contest. Locate some blocks in the grid, having the size either 1x2 or 1x3. Each number in the grid should be part of a block, indicating the amount of the possible movements of the block. Blocks can only move in the direction of their short edge.